Only if you are a lawyer or an insurance agent. Why? Because it is specifically in those venues that one hears of such meteorological aberrations being attributed to God. No doubt someone is trying to figure out how to sue Him also. When that terminology was adopted and who first decided to use it I do not know, but it is terribly erroneous because God is love and love does no harm to people or to their possessions. According to the Bible, wherein God speaks for Himself, hurricanes are acts of the Devil, God’s archenemy, and a fallen world. Ditto for tornadoes, cyclones, floods, famines (from not enough rain), and all other destructive “natural” events including World Series earthquakes. This is in keeping with Jesus’ statement in John 10:10 that Satan’s goals relative to mankind are to “…steal and kill and destroy….” Is that what hurricanes do? Yes—just ask the residents of Florida about hurricanes Charlie, Frances, and Ivan who are still looking for their houses. Are there any biblical records of destructive weather threatening good people or innocent bystanders? Good question, and it is answered by incidents in the Gospels such as Luke 8:22 and following, where Jesus and his disciples were on a boat crossing the Sea of Galilee. He fell asleep en route and a huge storm arose that threatened to sink them. Now, if that storm was an “act of God,” Jesus was not a very good Son because instead of going along with the program and drowning, he rebuked the wind and the waves and stilled them, thus messing up what His Father was trying to do. But why would his own Father try to kill him on the lake when his death on the Cross was the only hope for mankind? And what about the record in Acts 27 when a terrible storm raged for days and days and threatened to kill the Apostle Paul, one of the key figures in the early Church and the man who at that time was still to pen those magnificent Church Epistles that he later wrote in a Roman prison? What happened in that situation? God sent an angel to tell Paul that he and all those on board would safely make it to land. 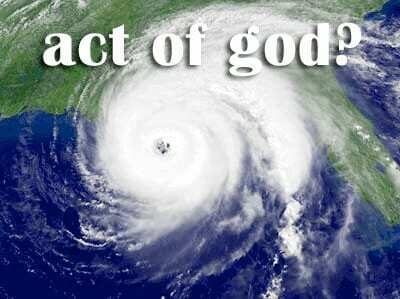 If God sent the storm, why would He then save the people from it? God is all good. He is light (1 John 1:5), He is love (1 John 4:8), and He wants only blessings for all people. Not only is He not the cause of hurricanes, etc., He is always doing His best to stop them from hurting people.